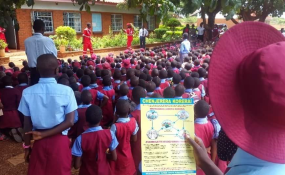 Zimbabwe Red Cross Society volunteers perform a cholera awareness drama for school children. THE cholera death toll has surged to 25 with four people said to have succumbed to the highly infectious disease on Thursday alone. Addressing the media on Thursday, Health and Child Care Minister Obadiah Moyo also announced an increase in the number of cholera cases with confirmed cases having now reached 3 766. "The number of cases has continued to soar," he said. "Yesterday (Wednesday), we had 3 067 and today (Thursday) it has gone up by 699 cases. "Death is now at 25. On Tuesday, we were at 21; so the number of deaths is at four, having three deaths at Beatrice infectious diseases hospital and 1 death from Glen View polyclinic." The newly appointed cabinet minister urged locals to stop the blame game and concentrate on ending a devastating catastrophe that is threatening to spread to other parts of the country. "We are not blaming each other. This is not a blame game. Let's work together and be on top of the situation," he said. Moyo said this as both Zanu PF and the opposition trade accusations on who has caused the epidemic. The MDC is in charge of the Harare City Council which is accused of failing to provide running water and collect rubbish from residential areas regularly while government has also been fingered for being the author of the current macro-economic hardships that has brought poverty among Zimbabweans and made it difficult for local authorities to function flawlessly. "Sanitation is being taken care of; there is need for further support to the local councils," Moyo said. The outbreak has been blamed on poor sanitation, the proliferation on food vending as well as continued lack of clean running which has forced residents, in some cases, to resort to unsafe wells to acquire the necessity. The country's health chief also said his ministry was taking control of the situation through a raft of measures, among them, the administering of intravenous therapy on patients adding that stocks needed replenishment. Government has declared the outbreak a state of emergency and further banned all forms of public gatherings in attempts to control the further spread of the disease.